Hi there! I’m Rohit, and I’m the guy behind The Aircraft King YouTube channel, this website, Facebook page, and Instagram. I live in Los Angeles, California and currently attend college at UC Berkeley in the Bay Area majoring in Computer Science and Data Science. So how did I become so interested in planes? Back in 2003, whenever we would drive around in LA, I would always sit in the back seat reading the Thomas Guide 2001 edition. For those not familiar, the Thomas Guide is a giant book with paper maps of the roads and freeways of every cross-section of the Los Angeles Basin. This is why I know my way around LA today like no one else. But back to the point, I oddly would explore the airport diagrams, particularly of Los Angeles International Airport (LAX), John Wayne Airport (SNA), and Long Beach Airport (LGB). My dad noticed this after a while and introduced me to Google Earth. I was enamored! I would scroll to all the airports around the world and just stare at the runway and terminal layouts. My aunt worked at Microsoft in Seattle, and she gave me a free copy of Microsoft Flight Simulator 2004. That was the main game changer. I explored all these airports in a virtual reality with all the different aircraft available by default. Being adventurous, I, of course, chose to fly the default 747, 737, and 777-300 at the time. But from the flight simulator fun, every trip we took after that in an airplane was just the best time for me. From each trip onward, my love for civil aviation kept growing and growing as I learned more and more from the many different airports I traveled through around the world. Eventually, a new flight simulator came out, Flight Simulator X, which even today is still the most current one Microsoft has produced. Having used the simulator for over a decade now, it has really allowed me to see and explore places I wouldn’t in real life (as of now), and see over and over the flights I enjoyed. This eventually inspired a whole new idea. Finally, in 2012 I created the YouTube Channel, to document all the trips I’ve flown and to be able to give you all good input on certain aspects of certain airlines to hopefully give you a good idea of what airline you would fly based on these reviews. 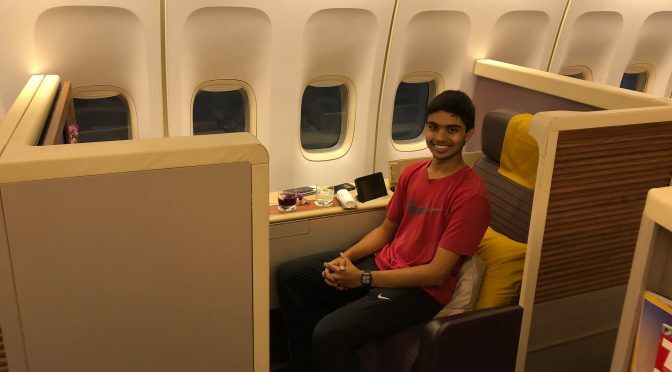 I love to travel the world, particularly my family home in India, so more than likely you will see a lot of flights to and from LA and to and from Mumbai or Pune, India.😉 I hope these reviews will allow you to better choose an airline the next time you travel to your next destination. I try to fly a wide diversity of airlines as much as possible to give a general overview of what each airline, airport, and travel experience are like. I hope you enjoy, and please send an email to me at any time if you have any questions! Cheers!